Shipping your eBay sales via standard small shipment carriers like UPS, USPS, or FedEx—especially in volume—can be a logistically complex process. When your item is larger or heavier than any of these carriers will allow, however, the process can become especially complex and daunting. 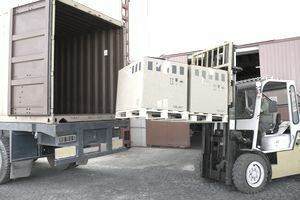 The shipment of large items that have to be arranged on a special per-case basis is called freight shipment and can present a special challenge if you’re unfamiliar with the logistical difficulties involved. Most of the time eBay freight shipments are LTL, or Less Than Load shipments, which means that they are too large or heavy to be sent with a standard shipping service but too small to occupy and justify the cost of an entire truck’s cargo space by themselves. You’ll find that you’ll pay rather more (in some cases a lot more) to ship items freight than even only slightly smaller or lighter items that aren’t classified as freight. For freight shipment, your packaging will need to be twice (or even more than twice) as good as it has to be for standard shipments. It is because freight shipments are often moved by forklift rather than by human power, and may switch trucks dozens of times en route to a destination. ﻿Freight shipments often require pickup and/or delivery to or from freight terminals. Even if the shipment can be picked up directly from the seller or delivered directly to the buyer, a surcharge is likely to be involved for such services, and they are likely to be relatively inflexible with regard to time of day and day of the week. Because shipping freight represents such a different experience from standard small shipment processing, it’s important to be able to identify freight shipment items before you list them for sale so that you and buyer alike are prepared for the shipping task (and costs) to come. Larger than 130 inches combined length and girth (measurement around the outside of the box plus the measurement of its longest side in the other direction), and/or heavier than 70 pounds. Larger than 165 inches in combined length and girth and/or heavier than 150 pounds. Many household and furniture items (chairs, desks, etc. ), as well as a variety of auto and truck parts and industrial tools and equipment, will run afoul of these standards and thus be classified as freight shipments. Be sure to state very clearly the necessity for freight shipping arrangements in any auction involving items that will have to be shipped freight, and to make clear who will be responsible for making such arrangements (buyer or seller). Wrap your item in plastic wrap from top to bottom to prevent it from getting caked in dirt, grease, and other warehouse filth. Strap it very solidly to a wooden forklift palette, available at most hardware and garden stores, since it will almost certainly be lifted by forklift from warehouse-to-truck and truck-to-truck (the use of a forklift on unpaletted goods is likely to seriously damage them). Protect the sides in thick styrofoam, reinforced cardboard, or even wooden crating if necessary, since it is also possible that your item will be grabbed by its sides using hydraulic lifting equipment and may thus be dented or crushed if it is unprotected. Strap to the outside padding, blankets, or another soft exterior coating that is difficult to remove or snag, especially for items with sensitive exteriors or finishes (i.e. furniture items). Note that in many cases freight shippers will refuse to accept items that they feel won’t survive the crush of the hydraulic lift or the arms of a forklift. If this is the case, don’t get angry—simply do a better job packing. They’re working to protect your item and transaction! If you want to save money on freight shipping, you can attempt to organize your own freight shipment through local trucking companies by specifying that you have an LTL load (supplying at the same time weight and dimensions) that you’d like to transport. Beware: packages sent this way are often entirely uninsured and unprotected—you are on the “pray plan,” praying that your item will ultimately reach its destination in one piece. In the end, it may not be worth the cost savings! If neither of these other options sounds acceptable to you, your final option is to use one of the many freight shipment brokers to organize your payment. These may be able to find for you an even better rate than you could get by attempting to work directly through trucking companies and tend to maintain relationships only with those lines that don’t give them too much trouble—meaning that you’re likely to get better quality carriers through a broker as well. In the end, however, the situation is the same: be wary and cautious as a consumer. Pack your item well, ask a lot of questions, and be sure to ask for the insurance and licensure credentials for anyone that will be carrying or handling your shipment. Keep in mind in all cases that freight shipment through trucking carriers that you organize yourself or through a broker is likely to be much less secure and safe than freight shipment through major carriers. If your cargo is a priceless antique, it may pay you to offer buyers the ability to come and pick it up themselves with a rented truck or method of their choosing—that way the buyer can have his or expensive new item handled in whatever way is most appealing to them.